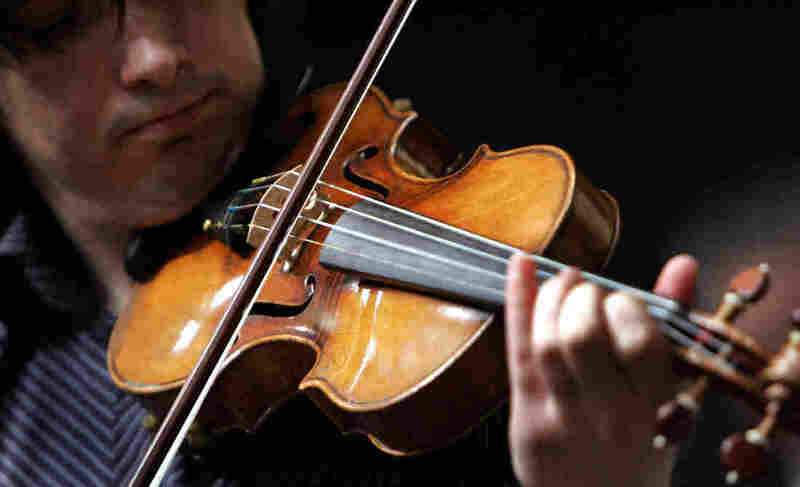 Stradivarius Violins Do Not Project Their Sound Better, Study Finds : Shots - Health News Old Italian violins like those made by Stradivari are famous for their ability to project their sound. But a study found people in a blind test thought new violins projected better than old ones. Violinist Adrian Pintea, from The Julliard School, plays a 1729 Stradivari known as the "Solomon, Ex-Lambert" in 2007 at Christie's in New York. Of the 17 players, seven said they couldn't tell which were which and seven got it wrong. Only three got it right. "In terms of physics, we haven't found any differences, basically, between new and old Italian violins," she explains. Fritz, an associate professor at Pierre and Marie Curie University in Paris, described the Paris audience as "people with an expert ear," including professional musicians, instrument makers and others. They listened to the violins with and without an orchestra accompanying. "Everybody knows about this claimed superiority, so everybody was quite enthusiastic about taking part," she says. What's more, when they asked the musicians playing the instruments how loud they sounded, the musicians reported that the instruments that projected best also sounded the loudest to the performer. "We haven't found any evidence that a quiet violin can be projecting in the hall," says Fritz, although she cautions that the study only included six instruments, and can't necessarily be extrapolated to all violins. She also says that how an instrument projects may have something to do with the person playing it, but this study doesn't fully test that possibility (the effect of the player is entangled with the choice of which music excerpts are being played). Plus, such an experiment would have required each listener to listen to nine pairs of violins twice, explains Fritz. Comparing 36 repetitions of the same piece, they decided, would be too difficult. The study was published Monday in the Proceedings of the National Academy of Sciences. Full disclosure, one of Fritz's co-authors, Joseph Curtin, owns a company that builds violins and violas. Fritz says she doubts her work will depress the market value of violins built by Stradivari, which can sell at auction for millions of dollars. In 2006, an instrument nicknamed "The Hammer" sold for $3.54 million. But Fritz thinks there's more to their value than their sound. "It's a piece of art. I mean, they are beautiful. We can't deny that," she says. For example, she says, "famous people want to pay full price for a Picasso rather than the copy, even if nobody will make the difference by eye. [It's] the same for instruments." Fritz says the modern violin makers she has spoken to about her past work have told her they find it liberating to learn that Stradivari's instruments are not objectively better by every measure. "In general, [violin] makers — especially young makers — are delighted," says Fritz. "And old makers as well, because old [violin] makers, they feel like they are liberated, that's what they told me ... because they feel less pressure to copy Strad." She hopes her work will help young musicians decide how to choose what instrument to seek out for performances and competitions. "As long as people are aware that they don't need to pay that amount to have something that works well, then it's fine." Editor's Note: This story was updated on May 10 to include additional information provided by Dr. Claudia Fritz about the experimental setup.